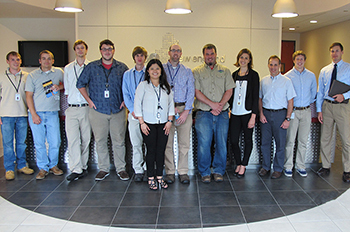 An internship at VELCO provides learning opportunities to college students who are interested in careers in power or electric utility engineering, environmental management and other related fields. It is also an opportunity for VELCO to work with and assess students’ knowledge, skills and potential for future employment.One of the most rewarding ways to jumpstart your career is to gain a hands-on experience in a professional and reputable company... a company like VELCO, one of the best places to work in Vermont and a leader in New England’s utility industry. We are committed to providing opportunities to students with careers goals and aspirations in the electric utility arena. You will be assigned in a paid position that matches your skills and academic field of study with VELCO’s business needs. You will be given an appropriate level of challenge that will allow you to apply your course of study and be part of our dynamic and collaborative working environment. You will partner with our employees who will serve as a resource for answering your questions about the organization and the department. You will also have meetings with your partner or mentor to stay up to date with your progress. You will be introduced to VELCO’s philosophy and core competencies by attending company-wide events. You must submit a letter of intent and résumé to Human Resources Department. If you are selected as a candidate, you will undergo pre-employment medical and drug screening. VELCO’S internship program is a 5 to 6 week opportunity that typically begins in June and ends in August. The deadline to apply for summer internships is March 30. Please send your materials to careersREMOVETHISBEFORESENDING@velco.com and include the word internship in the subject line. Indicate your area of interest, such as environmental management, engineering, accounting, or IT. You will be notified if, following review by Human Resources, you are an internship candidate.